Larger version available by clicking on images. 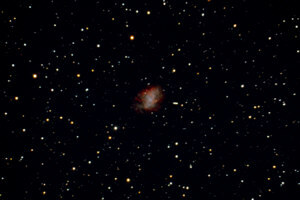 The Crab Nebula. This a 60 minute exposure on Kodak Ektachrome E200. 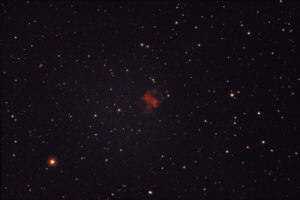 Taken using my Losmany G-11 and Meade 10" f/10 OTA and SBIG ST4 Autoguider. 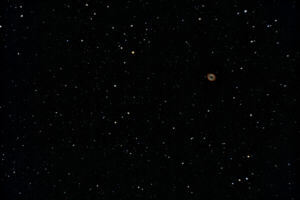 This image also captures two asteriods, 22 Kalliope and 566 Stereoskopia. Click on the image for more info. This is a composite of a 20 minute and 14 minute exposure on Kodak Elite Chrome 200. 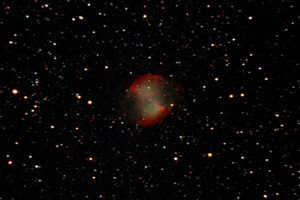 Taken using my Losmany G-11 and Meade 10" f/10 OTA with a ETX90 OTA as a guide scope and a SBIG ST4 Autoguider. 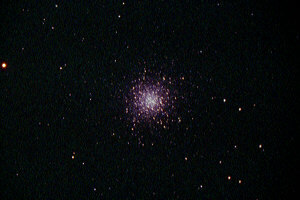 Glubular clusters due very well in my badly light polluted back yard. 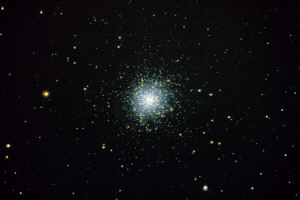 M13, also called the `Great globular cluster in Hercules' It is at a distance of 22,200 light years. This is a composite of 4 15 minute exposures taken with my Meade10" SCT OTA w/UHTC optics (a replacement in an old OTA). I used my ETX90 OTA as a guide scope. The film was Kodak Ektachrome E100VS pushed 2 stops. Click on the image for full details and an enlarged version. This is a composite of a 4 minute exposures and an 11 minute exposure taken with my Meade LX6 and a Celestron f/6.3 focal reducer. I used my ETX90 OTA as a guide scope. The film was Kodak PJ400. I scanned the frames from my HP S20 and Hamrick Software's VueScan 6.0.1. The raw images were color balanced, processed, cropped, and then digitally stacked using Picture Window. Make sure you click on the picture for the enlarged version. 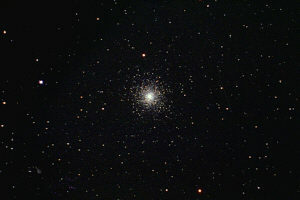 M15 maybe the densest of all globular clusters in our galaxy. It is 32,600 light years away . This is a composite of 3 20 minute exposures and 3 7 minute exposures taken with my Meade10" SCT OTA. The film was Kodak Royal Gold 400. I scanned the frames from my Minolta Scan Elite II and Hamrick Software's VueScan. The images were lightly processed using curves with Picture Window. Click on the picture for the enlarged version. 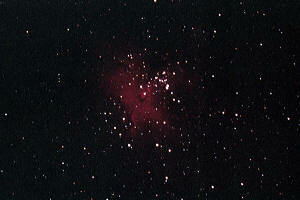 This is a 15 minute exposure taken with my Meade LX6 and a Celestron f/6.3 focal reducer back in September, 2000. My ETX90 OTA was used as a guide scope. The film was Kodak Supra 400. I scanned the frames from my HP S20xi and Hamrick Software's VueScan 6.2. The images were lightly processed using curves with Picture Window. Click on the picture for the enlarged version. 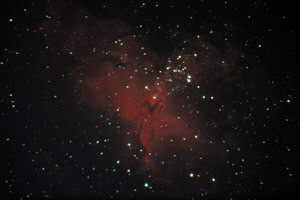 M16 is also called the "Eagle Nebula". It is 7,000 light years distant in the constellation Serpens. Taken with my Meade LX6 and a Meade f/6.3 focal reducer and my ETX90 OTA as a guide scope. The conditions were windy (a real pain with an old limp forked LX6) and thus the guiding was a mess. Also sense it was late September, M16 was only 15° or so above the horizon. This is a 10 minute exposure on Kodak Supra 400 and was scanned with my HP S20xi. The image was processed with curves and cropped using Picture Window. Click on the picture for the enlarged version. 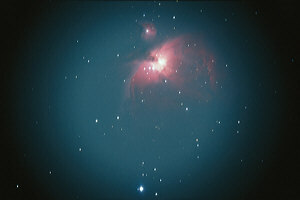 This image is a stack of 39 x 5 Minute exposures using a Orion "SkyGlow" Broadband light Pollution Filter. I used my un-modified KM Maxxum 7D with a custom White Balance for the sub-frames. 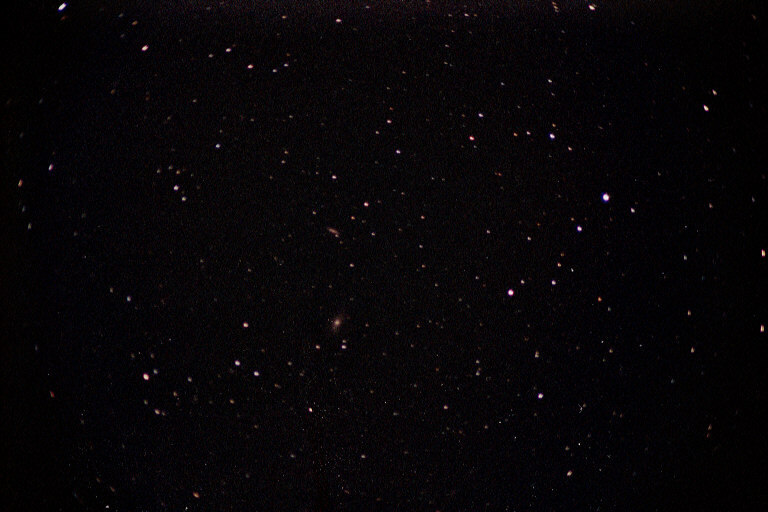 This is a composite of 5 exposures (25, 25, 15, 15, 8) taken with my Meade 10" OTA at f/7.5 on Kodak LE400. Heavy light pollution took its toll on the images but I am learning how to deal with it. The scans were processed and combined using Picture Window Pro 3.1. 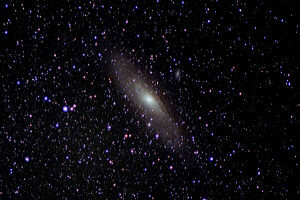 The Andromeda Galaxy lies some 2.93 million light years from Earth. Popular estimates had it at 2.2 or 2.3 million light years out but this was resently updated with data from the Hipparcos satellite. This image is a 30 minute guided exposure on Kodak PJ400. Taken at 200mm with my f/2.8 80-200 Tokina AT-X zoom piggy-backed on my 10" Meade LX6. 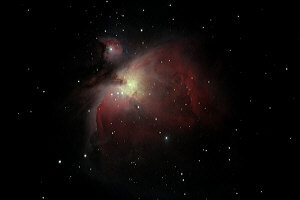 The Great Orion Nebula. Taken December 9, 2001 in my back yard in conditions that were worse then mag 4.0 ZLM. The results were fairly good and the focus was finally on. The Great Orion Nebula. I, like many others, decided that this would be a great object for my first attemp to take a guided, prime focus, deep space image. I set up December 18, 1999 in my back yard. The waxing gibbous moon was only 50° from M42 and I had the usual horrible light pollution. I used my ETX OTA with Vixen GA4 and 26mm Meade 4000 as my guide scope. The method for piggybacking the ETX to my LX6 would make most better astrophotographers cringe. But, with all that being said, the results were acceptable for a first attempt. BTW, this was a 10 minute exposure on Kodak E100VS slide film push processed one stop, using my 10" LX6 with a Meade f/6.3 focal reducer (which introduced the heavy vignetting). 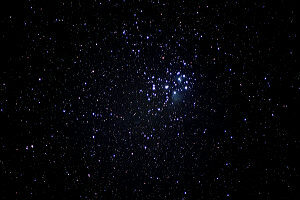 The Pleiades in Taurus or 7 Sisters. 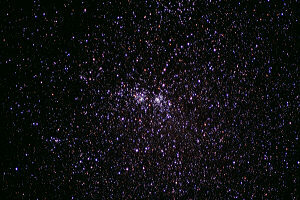 This open cluster is a relatively close 410 light years away. Captured on Kodak PJ400 with my f/2.8 80-200 Tokina AT-X zoom @ 200mm piggy-backed on my LX6. This is a vast improvement over the last image, which suffered from the effects of light pollution. Scanned using a HP S20 film scanner. 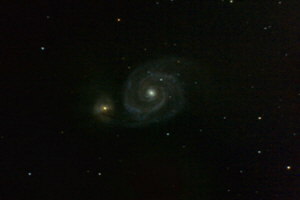 The Whirlpool M57 Galaxy. 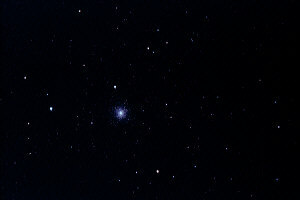 Its distance is something like 50 million light years. This is a combo of a 15, 20, and 30 minute exposure taken with my Meade 10" SCT on a Losmandy G-11 and a Celestron f/6.3 focal reducer on Kodak E200. The raw scans were processed and cropped and stacked using Picture Window. This is a composite of three 15 minute exposures taken with my Meade LX6 OTA with the new optics and Lumicon GEG at f/7.5 on Kodak RG400. The scans were processed and cropped using Picture Window. 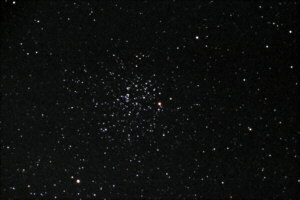 This isn't much of a cluster, but at least the focus and tracking are good! 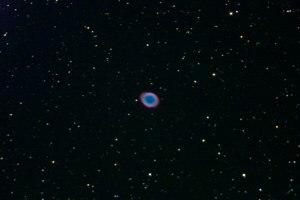 The famous ring nebula M57 lies in Lyra. 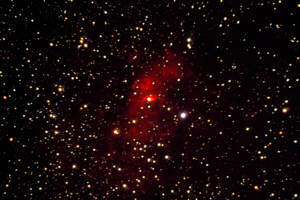 Its distance is still under debate but estimates place it at between 2000 and 5000 light years. This image was taken on August 4, 2001 - The night of a full moon! This is a composite of two 18 minute exposures taken with my Meade LX6 and Lumicon GEG at f/7.5 on Kodak LE400. The scans were processed and cropped using Picture Window. This is a much better effort then my earlier version. 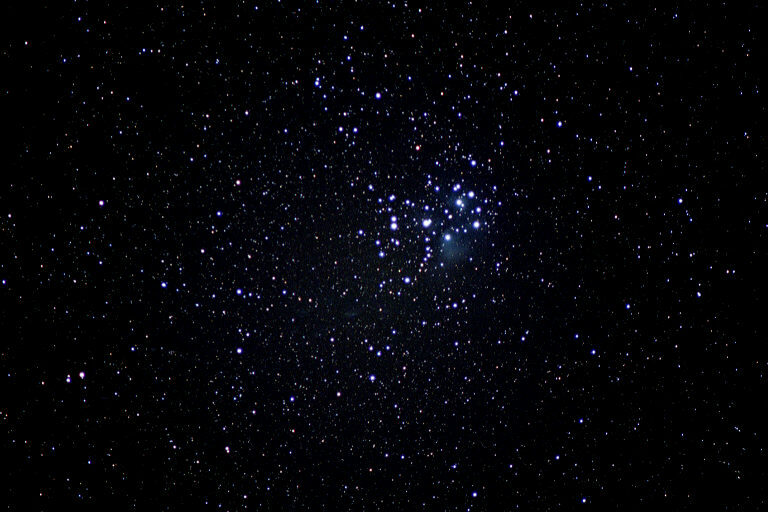 This one was taken with my Maxxum 7D from my light polluted back yard. 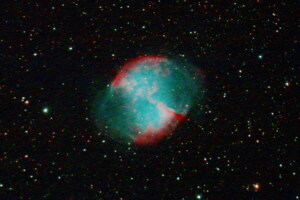 The Little Dumbell Nebula is so named because thru a telescope it looks a bit like its big sister M27 - only smaller. Also taken from my light polluted back yard. 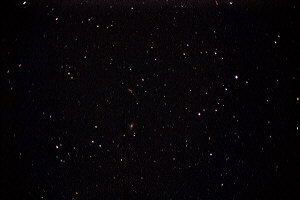 If you look carefully the two smudges you see in the center of this image are the galaxies M81 & M82. Captured on Kodak PJ400 with my f/2.8 80-200 Tokina AT-X zoom and 2x teleconverter piggy-backed on my 10" Meade LX6. The nasty teleconverter added a lot of coma and light roll-off in the corners to the image. This image was scanned using a HP S20 film scanner and then a gash put in the negative by the photo lab was repaired using Picture Window by DL&C. Light pollution also took a major toll on this image. M92 is the often overlooked "other" globular cluster in Hercules. 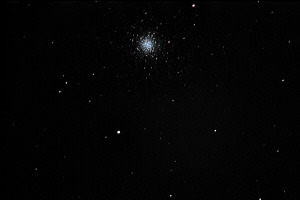 If M13 were not only 10° away, M92 would certianly get all the views. 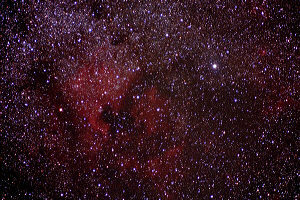 Taken June 25, 2001 from my back yard, this is a 20 minute and 15 minute composite on Kodak LE400. 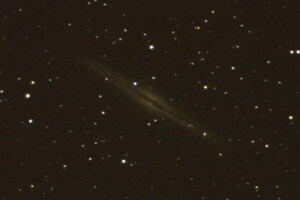 The Edge-On Galaxy in Andromeda. Taken from "Bear Bluff" near Mayfield, Michigan. 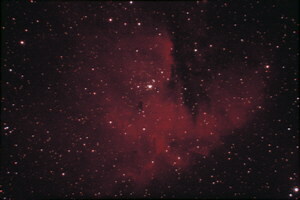 The North American Nebula is one of the most famous of all northern nebula. 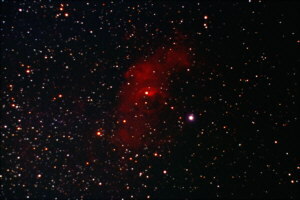 NGC 7000 lies in Cygnus (the swan). The bright star right of center is Deneb. This image was a 22 minute guided exposure on Kodak PJ400. Taken at 200mm with my f/2.8 80-200 Tokina AT-X zoom piggy-backed on my 10" Meade LX6. It was manually guided using a Vixen GA4. This was my first "successful" astrophoto. This image is a composite of seventeen (17!) 30 minute exposures on Kodak Supra 400 (11) and Royal Gold 400 (6). Compare the amount of capture with the old image below, this image was made from my 4.2 mag home site vs a dark site for the image below. 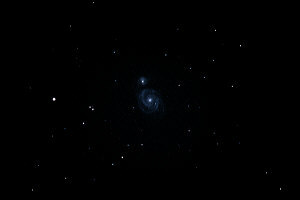 Taken with my 10" SCT with the GEG "set" at f/7.5. ST-4 autoguider errors were A1's to A3's. The focus was near perfect - as opposed to the image below. The Bubble Nebula is one of my favorites. This image is a composite of two 60 minute exposures on Kodak E200 pushed 2 stops from a dark site. The tracking is fine but the focus is way off. My 10" SCT with a GEG at f/7.5. ST-4 autoguider errors were A1's and A2's. 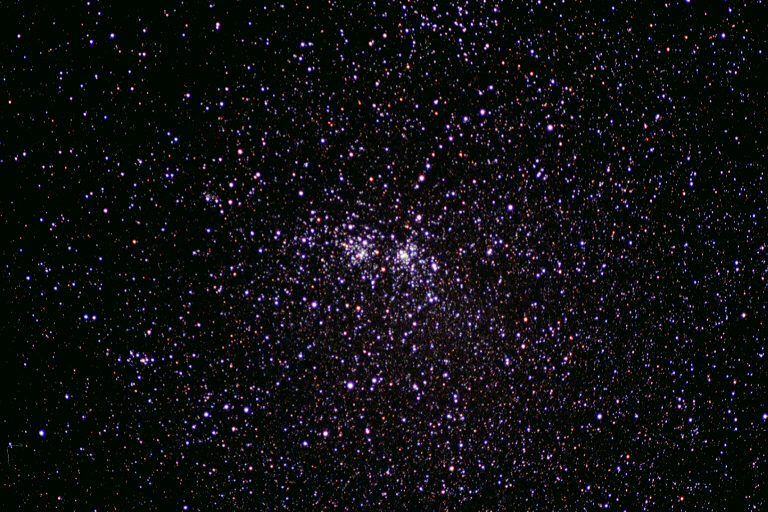 The famous Double Cluster in Perseus is a nice naked eye object. This image was a 15 minute guided exposure on Kodak PJ400. Taken at 200mm with my f/2.8 80-200 Tokina AT-X zoom piggy-backed on the LX6. It was rescanned and color corrected.